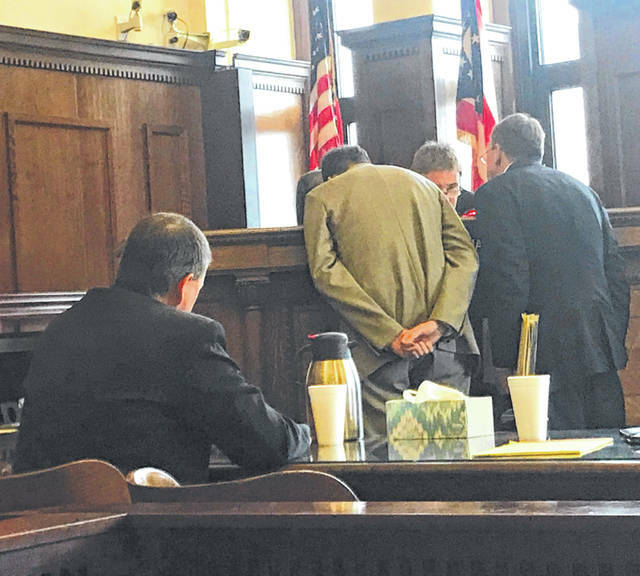 Anna Bolton | Greene County News Defendant Timothy Hedges looks on as Defense Attorney John Leahy, Judge Michael Buckwalter and Assistant Prosecutor David Morrison discuss proceedings. Defense Attorney John Leahy looks toward defendant Timothy Hedges as he gives his closing remarks to the jury. 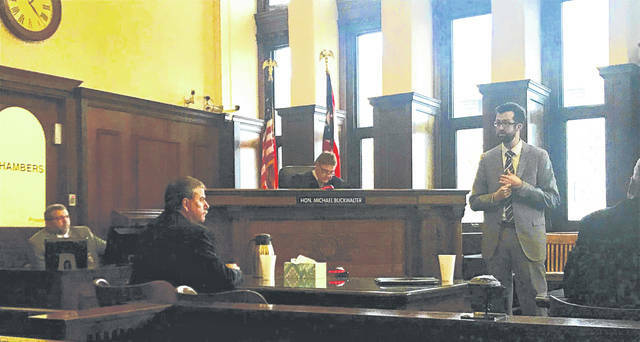 XENIA — A Greene County jury could not agree on a verdict in the trial for Bowersville’s volunteer police chief, accused of domestic violence. Timothy Hedges, 53, was accused of allegedly putting his hands around the neck of a 21-year-old pregnant female and forcing her out of his Fairborn apartment Aug. 18, 2017. Hedges, who testified during the trial, said he is also a paramedic. Deliberation ended around 7 p.m. Dec. 4. Judge Michael Buckwalter declared a mistrial due to the hung jury. Attorneys gave their final arguments to 13 jurors early in the afternoon before handing the case over for consideration. The victim also took the stand during the trial, describing the alleged incident that ended with Hedges’ hands around her neck. She said Hedges knew she was pregnant at the time; both attorneys agreed that this was true. Morrison alluded to bruises on the victim’s arms in photographs, which she said were caused by banging her limbs against door frames as she fought to get away from her assailant. Defense Attorney John Leahy described the victim walking further into the apartment after Hedges told her to leave and threatened to call the police. Leahy said the tactic was deliberately used to avoid causing injury to the victim. He argued that the bruises on her arms were caused by Hedges’ grip as he led her out. If Hedges had been convicted, the fifth-degree-felony would have required mandatory imprisonment, court records state. The prosecution will decide what happens next. https://www.xeniagazette.com/wp-content/uploads/sites/32/2018/12/web1_Approaching.jpgAnna Bolton | Greene County News Defendant Timothy Hedges looks on as Defense Attorney John Leahy, Judge Michael Buckwalter and Assistant Prosecutor David Morrison discuss proceedings. https://www.xeniagazette.com/wp-content/uploads/sites/32/2018/12/web1_Leahy.jpgDefense Attorney John Leahy looks toward defendant Timothy Hedges as he gives his closing remarks to the jury.